Concerned for getting quality petrol and not get cheated. Here is one of the best Hyderabad petrol pump in Habsiguda area on which you can rely. The Shell Petrol pump at Habsiguda does a decent job in serving its customers. Since it is from shell, the quality of petrol obviously provides a high value to every rupee you spent on it. 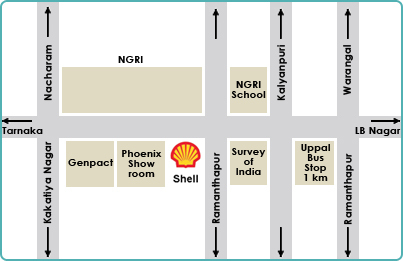 Habsiguda petrol pump is one of the fewer petrol pumps in Hyderabad operated by Shell. When you are traveling from Habsiguda signal to Uppal circle road, you will find this petrol pump towards your right. The Genpact office located near to it is pretty famous, and will serve you as landmark in locating this petrol pump easily. They serve from 6am to 10pm. Use the attached map to guide you better. This entry was posted on Sep 2009 at 2:11 PM	and is filed under East Zone. You can follow any responses to this entry through the RSS 2.0 feed. Your Feedback Matters! I was searching for a good synthetic engine oil for my bike and went there for taking engine oil on 15th Sept 2011. Bought Shell Advance Ultra Fully synthetic oil Rs. 755. The person (P srinivas) was not giving the bill and had to give the bill after my insistance bill no. #1994. I paid through debit card, to my surprise after 2 days they charged Rs. 20 extra as “FUEL SURCHARGE”. I didnt took any fuel from them!! Hopefully, the engine oil would be genuine.. keeping my finger crossed. I wont go there again even if the oil is genuine. Greetings, Thanks for the article. Every time like to read you.